Modified version of this great post by Dr Michael Shamoon on CORE-EM. 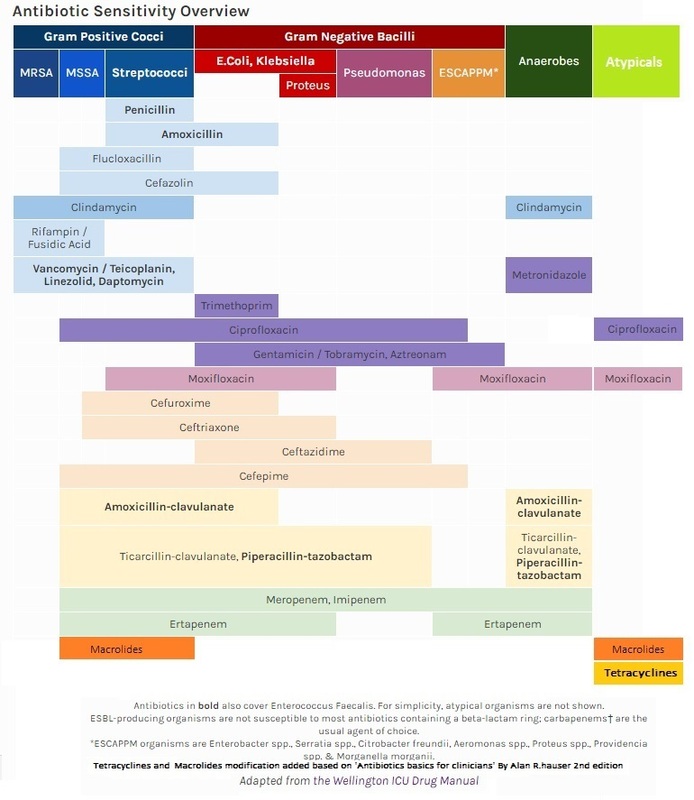 I added the orange box for macrolides and includes Clarithromycin, Azithromycin and Erythromycin. (Telithrmycin also has the same sensitivties). I also added now tetracyclines which includes tertacycline and doxycycline, these antibiotics strength lies in its action against atypical bacteria such as Rickettsia spp, Chlamydia spp, Mycoplasma spp, and also Spirochetes. Note: Some Strep. pnemoniae are sensitive to tertacyclines, and tetracyclines have modest action action gram negatives such as Neisseria.meningitidis and Haemophilus.influenzae. Tetracycline is good against Clostridia.spp of the anaerobes.